One of the interesting creatures we saw at Arches National Park was this large lizard, who crawled out from under a rock as we passed, apparently wanting to enjoy the morning sun. 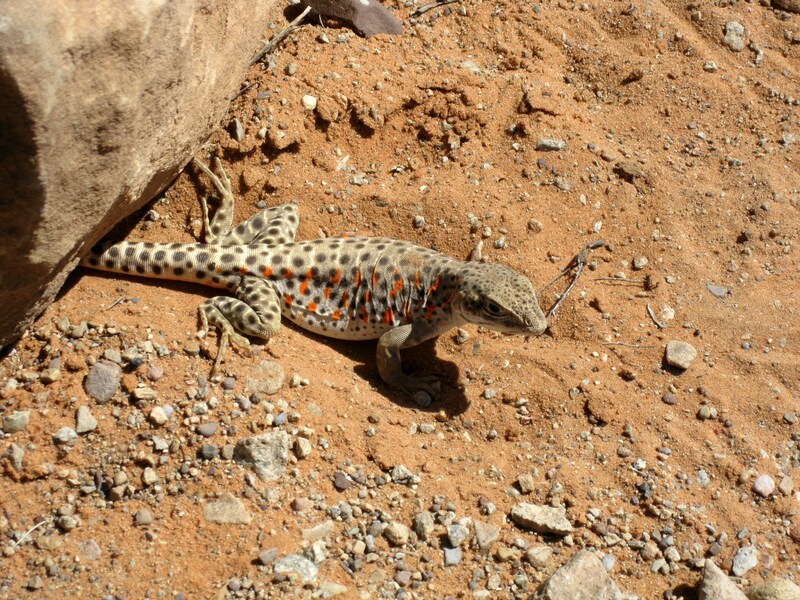 It’s a long-nosed leopard lizard (try saying that five times fast), or Gambelia wislizenii. While we watched, it repeatedly crawled back under its rock only to reemerge a moment later, apparently unable to decide whether we were really a threat. When we finally continued along the trail, we were surprised to immediately find two more! Apparently the red markings along the sides of these first two mean that they are gravid females. These diurnal lizards eat other, smaller lizards as well as insects and small rodents. Though there’s nothing in the photo to give a sense of scale, the ones we saw were easily a foot long. Above, a male (no red bars) basks on a rock. 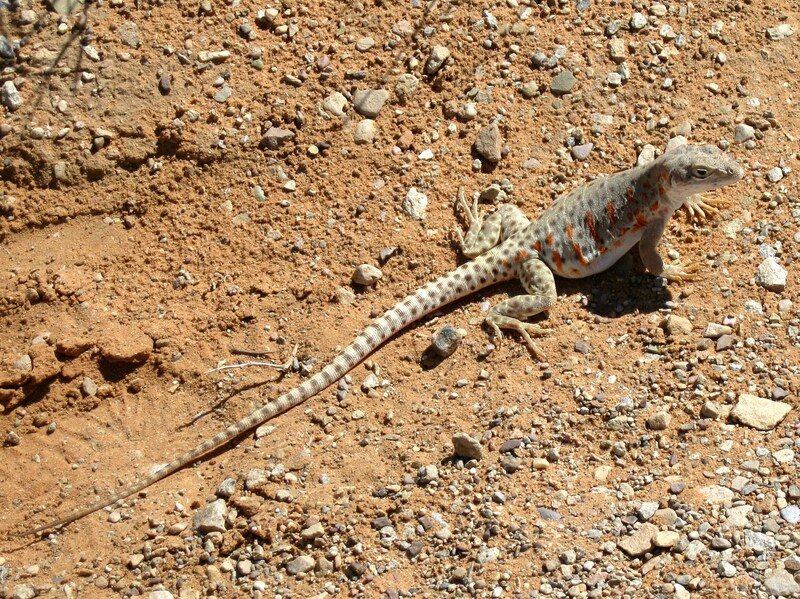 These guys have a close cousin, the blunt-nosed leopard lizard, that is a federally endangered species. Actually, these are very pretty. 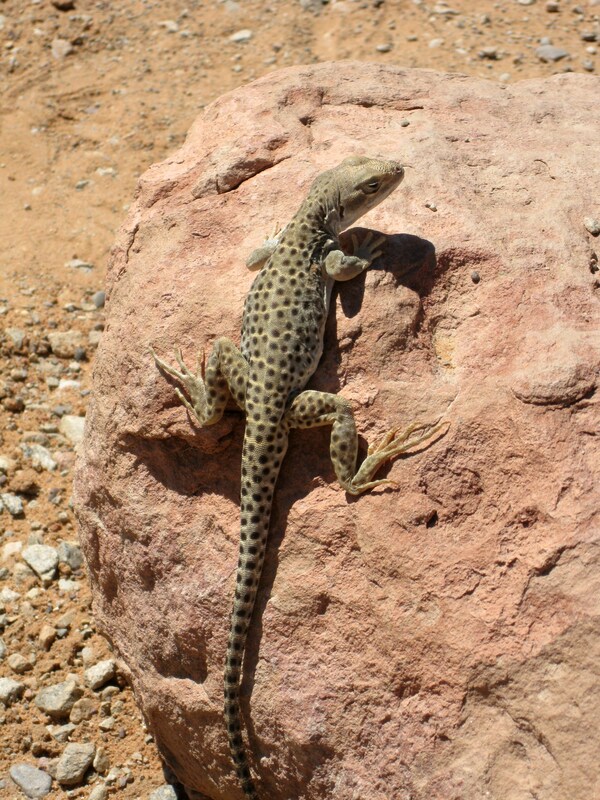 I am only sorry, that these live long nose leopard lizards weren’t leaping. Wouldn’t it be fun if we gained orange spots when pregnant? Yay lizards! Nice pictures of very photogenic lizards. Neat place too, the interesting colours of rocks and soil. Those are large lizards! OK, I’m an Ohio kinda guy, but still…a foot long is pretty decent! Next Next post: What Is Cryptobiotic Crust?